The issues around deck load capacity is one I receive often from visitors asking how much weight they should design their deck for. The discussion quickly leads to the overall strength of the framed structure. But that is only one part of it. That's because any analysis of what load a structure may bear upon itself and its foundation must involve the support post network and soil bearing capacity. It truly is a system - not unlike a chain - where the weakest link will lead to the failure of the deck. Many people are intimidated with trying to figure out the load capacity for a deck. Even some contractors aren’t sure where to begin so they just over build – which may be entirely unnecessary and cost you more money. 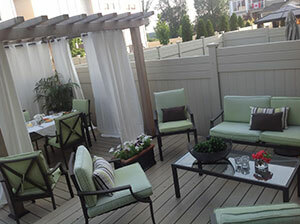 Another problem that can arise from over building is a sinking deck. Yes, even if you build a strong deck it can gradually sink into the soil if you don’t take into account the size of footings with respect of the load for the deck. Once your deck starts sinking it can rip the ledger board away from the house or you will have to jack up the sunken area, excavate and pour a new larger footing. That's what we will discuss in the second half of this article. The good news is that the concepts and the math used for determining loads on decks and other structures are really quite simple. I’ll explain how you do it and you can go build that deck confident that it will be strong and stable and still standing years from now. The first area to think of is the actual framed deck. This structure is comprised of perimeter joists - sometimes called rim joists or band joists. Then there are the joists in the middle. These are sometimes called infield joists or inner joists. You'll hear a number of terms. And this framework is supported by a number of beams - sometimes called carrier beams because they "carry" the load of the structure. Design Load, Dead Load, LIve Load - What does this mean? The IRC and other similar codes in other countries, like Canada or the UK all work from a similar starting point for what a floor deck should be engineered to support. These standards are borrowed by deck builders and come from the actual code requirements used for the floor deck of a residential home. The load that is placed on your deck is expressed in pounds per square foot (psf) and the total load or more appropriately, the design load, is comprised of the dead load and the live load. Dead load is basically the load created by the weight of the deck itself. This is usually about 10 psf. Live load is created by all the extras like furniture, planters, and people. This is usually about 40 psf. Together the design load would be 50 psf. 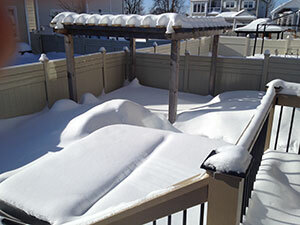 Of course, if you expect a lot of snow to sit on your deck over the winter or envision an 8,000 lb hot tub on the deck this could increase the required load capacity of your deck up to 100 psf. Not every place experiences seasonal changes like this dramatic series of photos shows. But you can see why you should consider all the forces that will be at work on your deck and build accordingly. To avoid referring to complicated engineering tables and for the purpose of building a deck, let us start with the idea that using standard 2x8 softwood lumber at 16" o.c. joist spacing your deck will easily meet the 50 psf threshold. Yes this is a concern but the net effect or changes you might have to do to increase the strength of the deck could be as simple as using 2x10 joists at 12" o.c. spacing. The framed structure will typically handle the added weight quite easily. The worry will be your beam spacing, support post size and most importantly how many footings and how much weight will they impose directly on the soil below. This is critical because if you overload the soil more than it can bear, the deck will start to sink. A very bad thing. To determine the maximum load capacity of your deck, start by calculating its total area and multiply by 50 psf. So a 100 sqft deck would be designed to support 5000 lbs. Don't get confused with what weight you might think or want to load the deck with. If you drove a dump truck over it, yes this would throw all our calculations out the window. But we are building a deck to support known loads consistent with the purpose for which the structure is known to be used for and the 50 psf number has a safety factor in it. That is why engineers have settled on this as a safe value. So with a total deck load capacity of 5000 lbs we now move to the "slightly" more complicated discussion about tributary areas and how this overall load is now distributed around the entire deck and onto the soil below. Stick around. This is the fun part. Our deck is as simple as it gets in order to illustrate the concepts deck load capacity and transfer of weight within each tributary area. 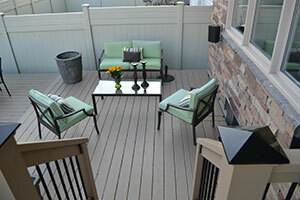 This deck is 10`x10` or 100 sqft. There is a ledger board attached to the house. The joists run perpendicularly out from the house for 10 feet at 16 inches on center. The carrier beam runs perpendicular to the joists with its center at 8 feet from the house and the cantilever beyond its center point is 2 feet. There are three support posts 3.5 feet from center to center. The beam cantilevers 1-6` past the outer posts to the perimeter of the outer most joist. For example the unsupported section from the ledger board to the beam is a distance of 8’. Therefore the first midpoint is 4’ from the house and marks the separation between supported load areas as you move outwards from the house. Area A equals 4x10 or 40 sqft. 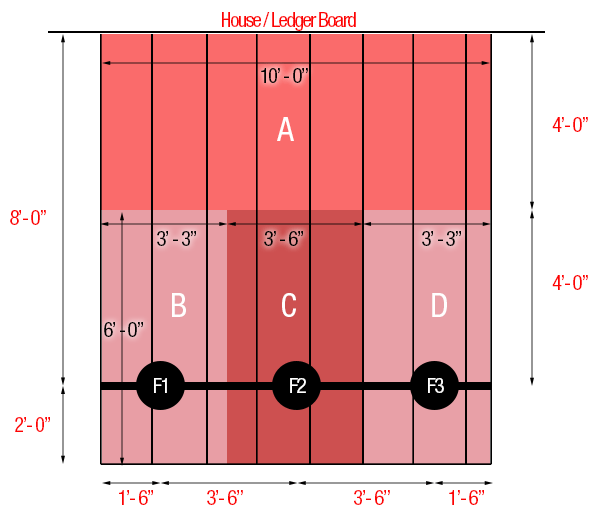 There are four tributary areas on this deck: A, B, C and D.
Tributary Area A is confined between the midpoints of its two adjacent support members, the ledger board and the beam. The outside perimeter joists confine the width of the area. For example the unsupported section from the ledger board to the beam is a distance of 8’. Therefore the first midpoint is 4’ from the house and marks the separation between supported load areas as you move outwards from the house. Area A equals 4x10 or 40 sqft. This means that the force exerted over the deck between the beam and the house is supported 50% by the ledger board and house and 50% by the beam. 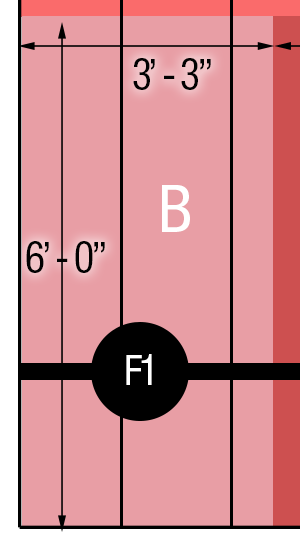 Area B extends from the 4’ point outward to the beam and beyond to the end of the deck. Since there is no support member past the beam the length of this load area is 6’ (from the 4’ mark to the 10’ mark). 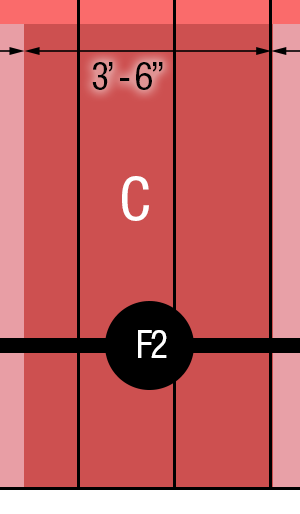 The width of Area B extends to the midpoint between the end post and the center post. The end post is 1.5’ from the end of the beam. The distance between the end post and the center post is 3.5’. Therefore the midpoint between the two posts is 1.75’. That means the total width of the first supported load area extends from the end of the beam to the 3.25’ mark along the beam (1.5’ + 1.75’). The dimensions of Area B are 6x3.25 or 19.5 sqft. 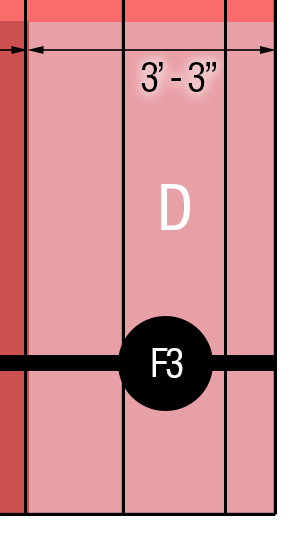 Incidentally, tributary Area D is identical to B.
Tributary area C is slightly larger than B and D. It is 6`long but its width extends from the midpoint of footing F1 to F2 and F2 to F3. This distance is 3.5`. Area C is 6x3.5 or 21 sqft. Notice that the middle tributary zone must carry more weight than the adjacent areas B and D. This is a common characteristic you will find in most decks and so sometime, if your bearing capacity of the soil is quite low, you may have to increase the size of the middle footings or add another support post in order to not overload the soil. Area D is identical to Area B. Given that the shape and support configuration of the deck is symmetrical. 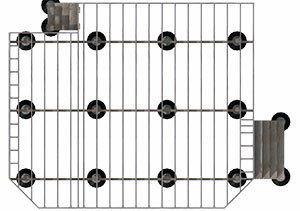 The dimension are 6x3.25 or 19.5 sqft. Lastly, Area A is supported by the ledger board across its entire length. We express this load value as lbs per lineal foot. The ledger is 10' long so every foot of ledger must be designed to carry at least 200 lbs of load. Now that we know the loads that we expect to be exerted on each post below each tributary area and thereby onto the soil below, we can design the size of our footings combined with any knowledge we may have about the soil type. For example, I would design the footings for the other posts to also handle this 1050 lbs load - engineer up to the highest common denominator. This is the last area of concern. The type of soil determines how heavy the load can be before the footing is susceptible to settling. Organic soils are the worst. If you have organic soils with rotting material it must be removed and replaced with granular stone and compacted before a footing can be installed. The other types of soils most commonly encountered are clays which have varying degrees of moisture. The concept is that the more moisture retained in the soil, the lower its bearing capacity. The typical range of bearing capacity for clays, starting with the softest with higher moisture content to the hardest with lowest moisture content is between 2000 psf and 8000 psf or more, respectively. In our example the maximum load any of the footings will encounter is just over 1000 psf. 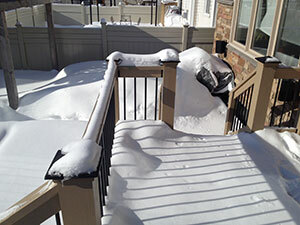 It is unlikely that soil conditions would be a major concern in this deck building project. If you do find the soil is questionable, the best solution is to get a soils engineer to run a quick test to determine the best course of action. You should now be ready to go off and start building your brand new deck confident that it will handle the load you are going to throw at it. Lets assume this soil is typical and can easily bear 1800 psf. We'll work with that. If each footing was 1 sqft then all of the weight of the given area would be imposed over that 1 sqft area. Therefore, if the footing was twice as large or 2 sqft only 525 lbs (half of 1050) would be imposed on each sqft below Area C.
We can effectively reduce the force imposed over a given area by using a larger footing size and distributing that weight over the larger area. We could build a square footing that is 12"x12" or one sqft and we would be fine because all the tributary ares carry total weights much less than the soil's bearing capacity of 1800 psf. But let's use a round footing because we bought some concrete tubular forms. If we use a 16" diameter form we can calculate its surface area by using the formula for area of a circle as π r². This works out to approximately 1.4 sqft. To determine what weight per square foot is actually imposed on the soil below each tributary area, we just divide its weight by the area of the footing. Let's see what values we get for each footing. In every case the loads imposed are less than half and almost a third of what the soil really could bear. So your deck will not sink into the ground. Go ahead and build the frame as strong as you wish. But keep in mind the two concepts of the strength of the structure and the bearing capacity of the soil. This is a really simple deck to make these calculations with and is very helpful at illustrating the concept. It can get trickier as you change the complexity of the shape. But if you know and understand these fundamental principles, deck load capacity questions will be easy for you. 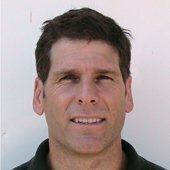 Richard Bergman is the editor of DecksGo.com and a builder of custom homes and too many decks and fences to mention. He is also an active product developer and patent holder. Richard holds a B.Comm and LLB degree and particularly enjoyed patent law. Beyond theory, he loves taking ideas and turning them into physical realities and that is why he builds. He is always working on something interesting and loves to share his knowledge with those who may need some help. If you would like to be a featured builder and share an original article of interest to our visitors contact us and let us know.